Confident Group, a leading group in the field of real estate and construction has successfully completed 132 projects within the various parts of Kerala, Karnataka, UAE and USA. Are you bored of seeing stereotype villas where there is nothing different that attracts you to be a customer to them? 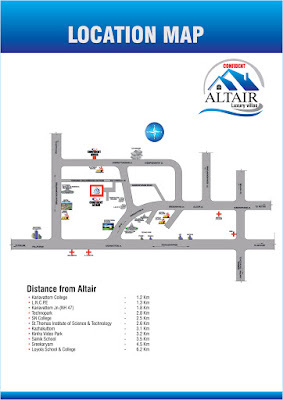 Come in and be surprised to see this amazing bit of work by confident group, their 123rd project "CONFIDENT ALTAIR". Have you ever been lucky enought to experience heaven on earth? No? Then visit this place and get ready to be amazed and let your heart beat a skip by seeing the sceneric beauty outside and the clean, well built and serene environment inside of your gonna be home. Do you have a position for walking? Have you ever imagined yourself opening your front door and stepping into the country side for a walk? Well this way well be that kind of place where you will be surrounded with lush green serenic locale where you have a peaceful walk long down the valley. There are also other added benefits where you can enjoy a swim in the pool, multi-purpose gym, games room, party hall etc. CONFIDENT ALTAIR is situated near the IT hub of Kerala, Technopark and close to Lekshmibai College of Physical Education which will be globally renowned center in near future with International Stadium. The Location of the project is well placed in the outskirts of the city of Trivandrum in Kariavattom, a serene locale near Kazhakootam that has quick access with a Hassle free drive to Technopark and Major Educational Institutions, National Highways and Bypass. Altair, the 123rd project of confident group and 1st villa project in the capital city aims to add touch of colour, class and life to the lives of people who find their way into its lap. Shout out loud for this highly anticipated project and start booking your positions at "CONFIDENT ALTAIR" because this is where your life begins. No place too far, no task too demanding! 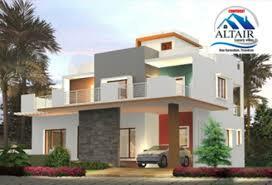 The price range of the project starts from 75 lakhs onwards.